Pumpkin is surely a must-pick item in setting every single Halloween decor, without it, you can’t really say that you have a nice decoration for this fall. It is such an icon of Halloween that cannot be missed. There are hundreds of ways to make the pumpkin look way more attractive to enhance the catchy-look of your Halloween decor. Some creative fellows choose to carve it which may be exhilarating to try, but not all of us can cope with it. For others, this activity can be exhausting, it’s messy, boring, and even dangerous since carving involves some sharp stuff. So, if you are a kind of person who just can’t deal with pumpkin carving, here we share some inspiring ideas how to beautify the look of pumpkin for your ultimate Halloween decor. 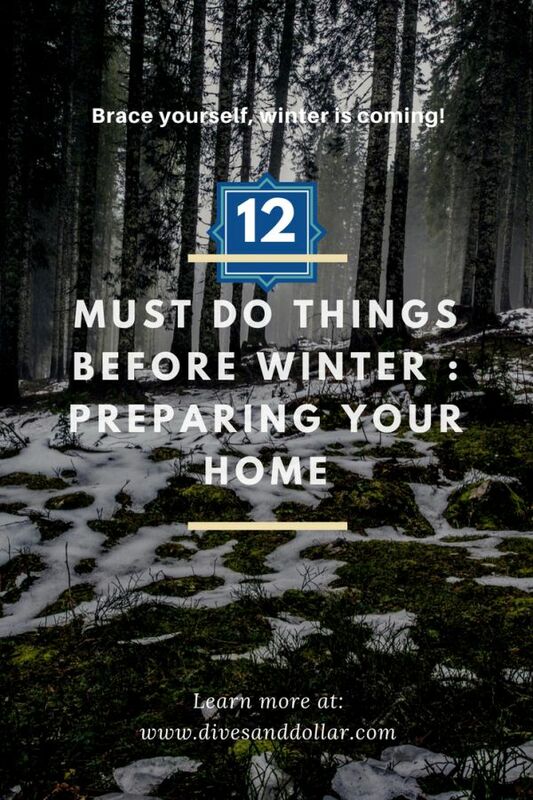 You don’t need to have some particular skills, lots of budgets, and lots of elbow grease. They are much easier to handle than carving, but the result is definitely mesmerizing. Let’s keep scrolling to find out some tempting no carving pumpkin ideas that you have to try this Halloween! Let’s start with this gorgeous blue pumpkin that is inspiredA�by the beauty of Elsa from Disney’s Frozen. This one will become not only the dazzling accent of your Halloween decor but also kind of the latest decor that you can choose this year. 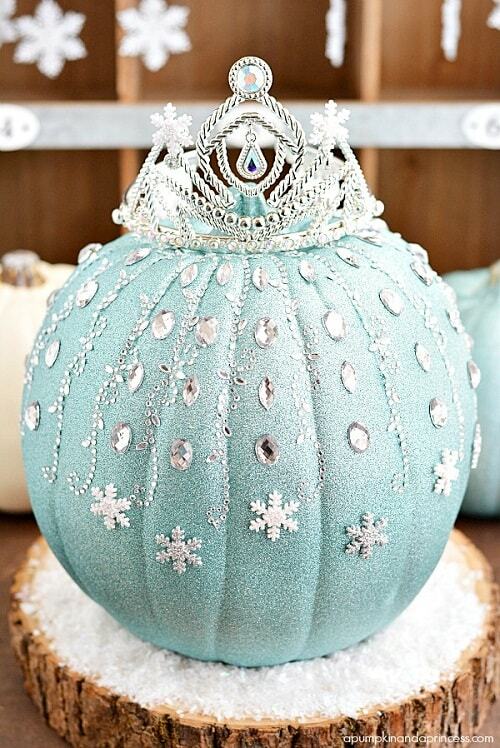 Go grab a white pumpkin, pain it with light blue glitter spray paint, stick some pretty adhesive rhinestones, Bling on a Role, and crystal snowflakes and you can have your Frozen Elsa Pumpkin all set. 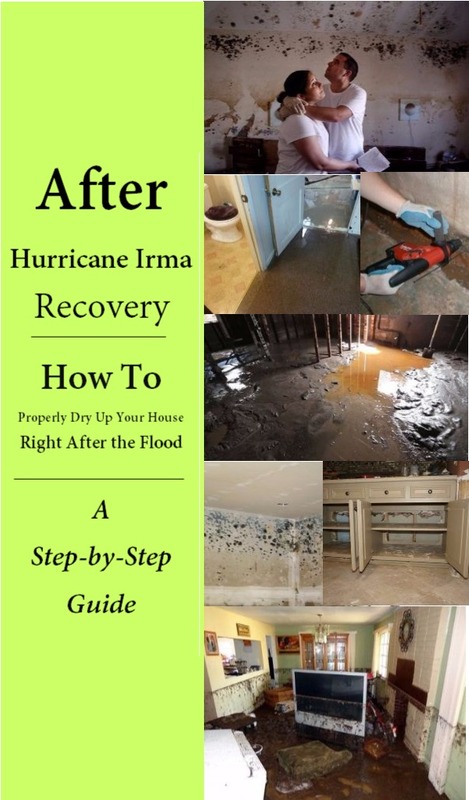 The cost is fairly affordable and the steps are very easy to try! 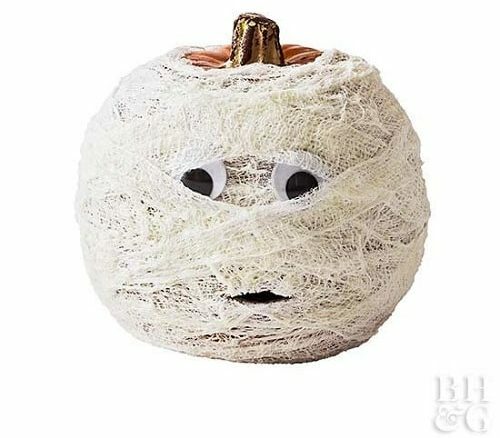 The cute and spooky mummy pumpkin for your kid’s Halloween decor. You’ll need a plastic pumpkin, wrapped it the cheesecloth, add some googly eyes, and paint the mouth with black craft paint. To make it look more spooky, you can paint the cheesecloth using the glow-in-the-dark, so it will become more dazzlingly spooky! 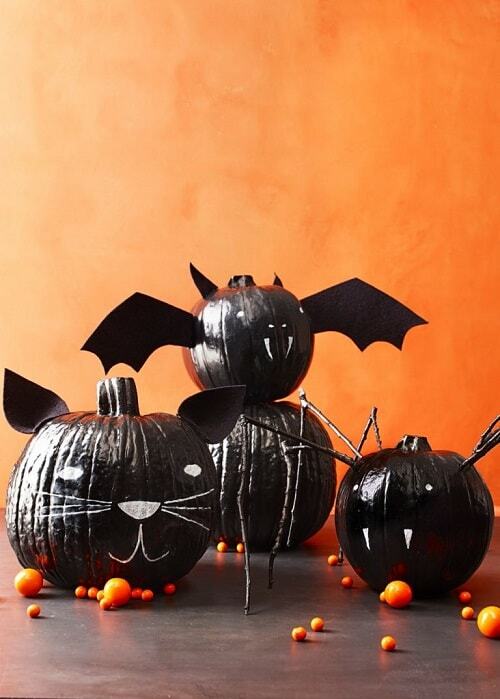 The super adorable idea for you who love to choose the black pumpkin for your Halloween decoration. Here, the pumpkin is double-coated with the black chalkboard paint, accented with the face drawing using the white paint, then attach the black felt and twigs for the bat wings and spider legs. This is so fun to make and will be such a unique stuff to decorate your porch this fall that will surely catch many glances! The attractive no carving pumpkin ideas for you who hate to deal with the sticky fingers. You’ll just need some packs of gold and silver thumbtacks, then you can start to draw your imagination on the pumpkins as you wish. It is a surely a choice decor to add a bit of casual touch to your Halloween decor. A superbly easy no carving pumpkin ideas that you can try with your kids! 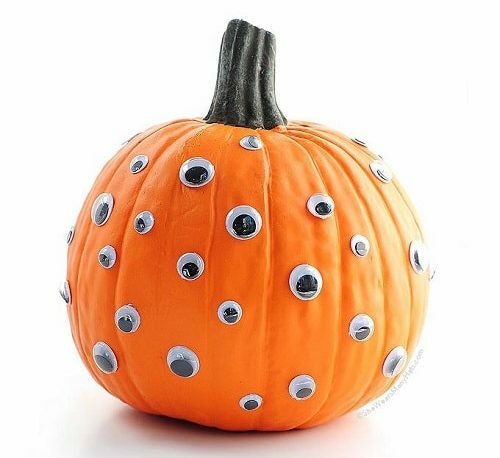 All you need to prepare is a faux pumpkin with some googly eyes in various sizes. The result is a weird-looking pumpkin that will totally enhance the spookiness of your Halloween decoration! The beautiful idea of creating a green decor out of the pumpkin that is totally worth to try this fall. 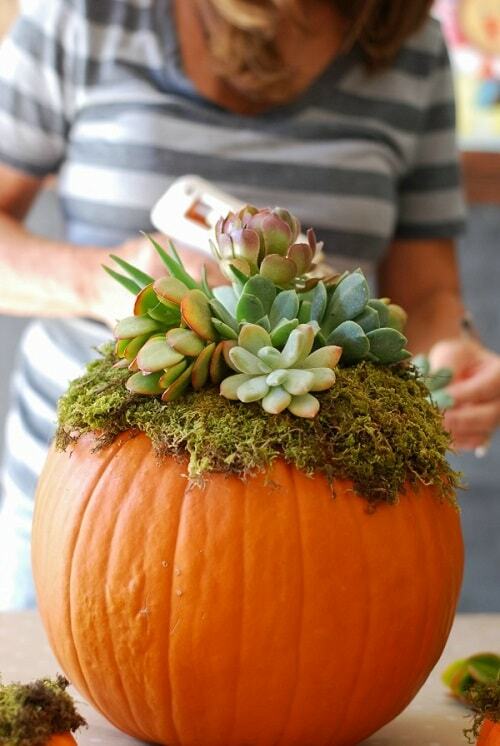 You will need some types of succulent and arrangeA�them on the pumpkin as gorgeous as possible. The look of this no carving pumpkin ideas is totally wonderful, and the process is very easy to do. The succulent is planted on the moss that is secured by the spray adhesive and the glue gun. This is a beautiful pumpkin that will add a perfect touch of femme fatale to your Halloween decor. 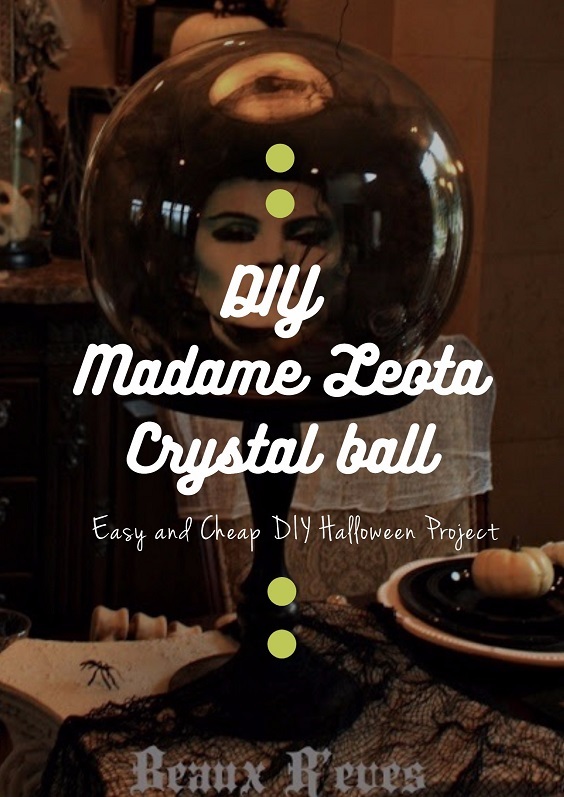 The most exhilarating part is that this is kind of effortless DIY Halloween stuff with a very small cost. 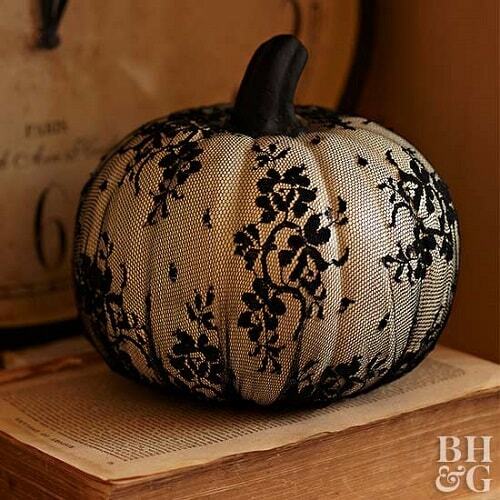 By only using a black floral lace, you can make this pretty pumpkin in no time. Just make a single hole for the stem opening, wrap the lave on the white pumpkin and you have it all set. The kids will surely love this project a lot! 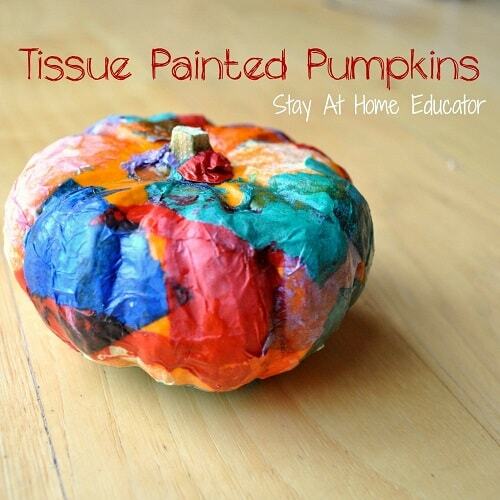 This decor is made of some colorful tissue papers that are stuck on the pumpkin surface by using the glue. 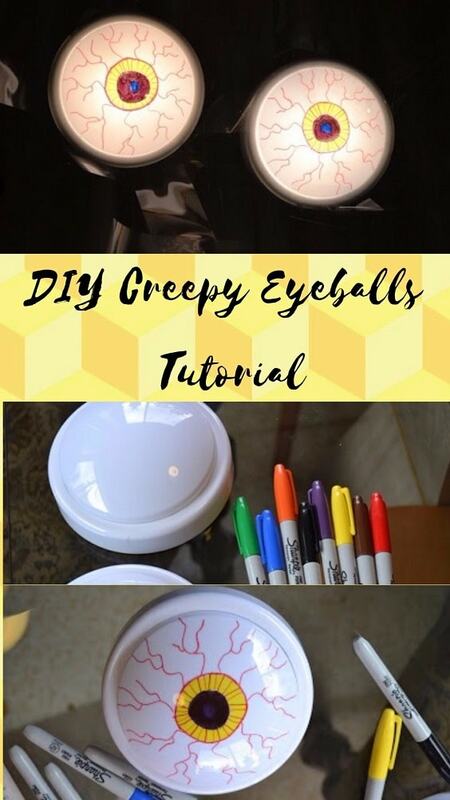 It looks so adorably unique to give a more colorful look to your spooky Halloween decor. The cute and spooky no carving pumpkin ideas which will add a very catchy sweet treats holder for your Halloween decor. 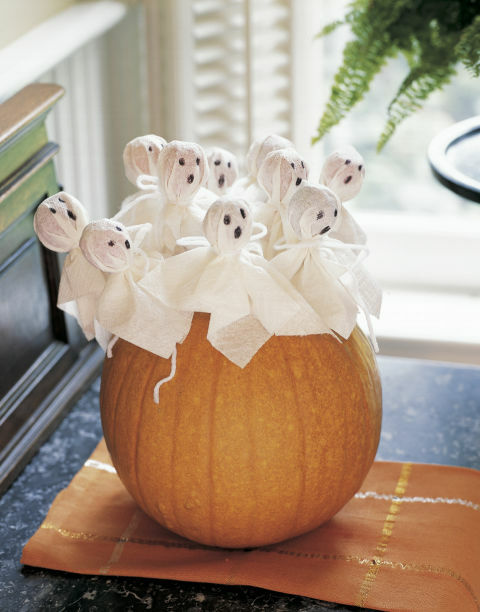 You’ll only need to dress up each lollipop with a white sheet and attach some on a pumpkin. Place it side by side with the mummy luminary and pumpkin mason jars and you’ll have a super attractive decor for this fall. If you are looking some beautiful dazzling white pumpkin to add a touch of glams too your Halloween decor, this mesmerizing idea can be your option. With some floral white accent on its white surface which is combined with the golden stem, the pumpkin looks very wonderful. It’s a very simple color combination which creates a tempting look to try. 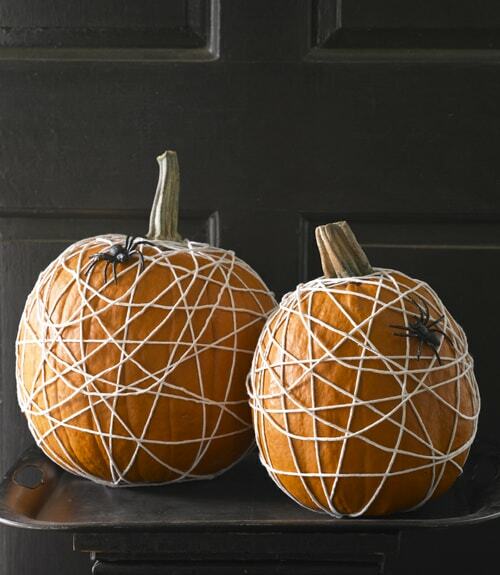 Go grab some cotton twine and the plastic spider to create this creepy no carving pumpkin ideas for this Halloween day. You just need to stick the twine and spider by using the hot glue stick, then everything is done. This decor will be a nice complement to place next to the drippy candles and glowing eyes lantern! The unique no carving pumpkin ideas that that will create a little bit of industrial touch to your terrifying Halloween decor. 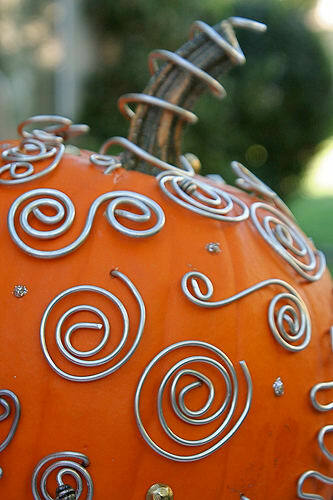 The wire is bent into some various shapes, place them randomly on the pumpkin’s surface and it’s ready to serve! Don’t miss to cover the stem with the wire too! 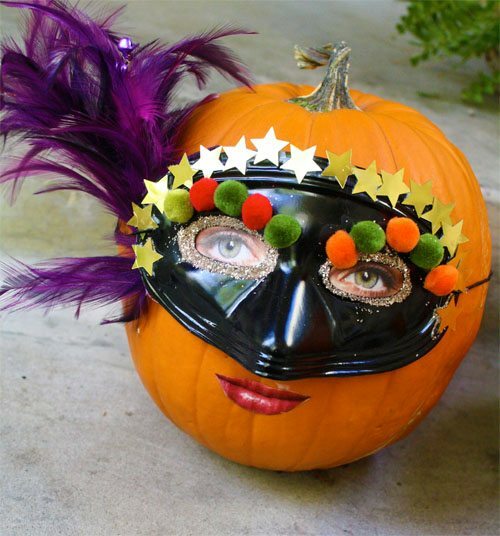 Another attractive no carving pumpkin ideas to give an ultimate glamorous touch to your Halloween decor. You’ll need to purchase a faux pumpkin then coat it with white spray paint, stick some sparkling confetti on its surface and it’s done. 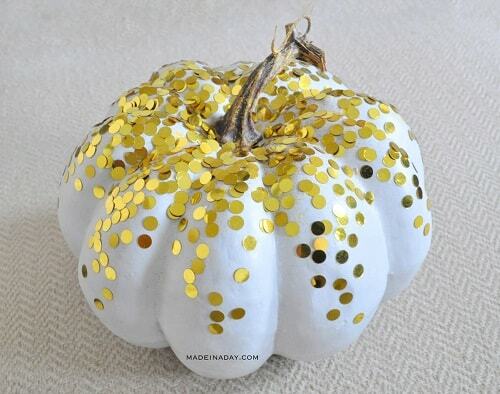 You can also another color of theA�confetti like the silver one on the white pumpkin. A spooky pumpkin in BW style with some cute bat accents. 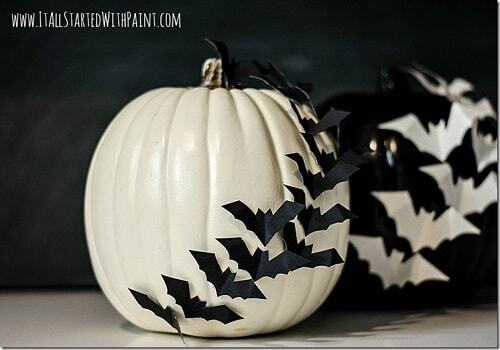 This one looks so attractive with the combination of white pumpkin and black bats or vice versa. The materials that you’ll have to prepare include the black and white artificial pumpkins, black and white poster board sheet, and a flying bat punch if you can’t draw your own bats for the pumpkin. 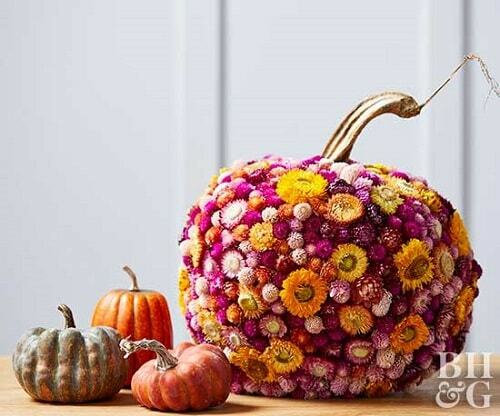 This vibrant floral pumpkin will be one of the major focal points of your Halloween decor. The colorful dried flowers are glued on the plastic pumpkin, then to make it look more glamorous, the golden stem is attached. A Halloween pumpkin with ‘Boo’ word written on its surface may sound to common, but here such kind of decor is made into a whole new style by the help of the black buttons. 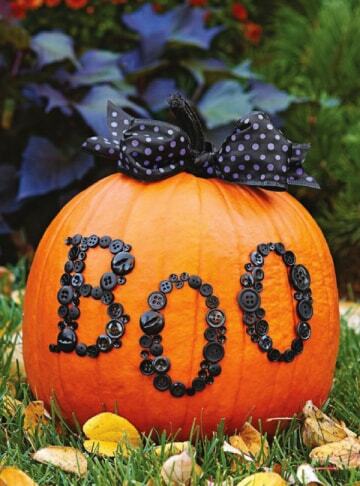 You have to prepare dozens of black buttons in various sizes to form the ‘Boo’ word and glue them on the written letters on the pumpkin surface. Then, coat the stem with black paint and tie a BW polka ribbon for a more fashionable look. The stunning no carving pumpkin ideas that you can make in the fewest effort and lowest budget possible. 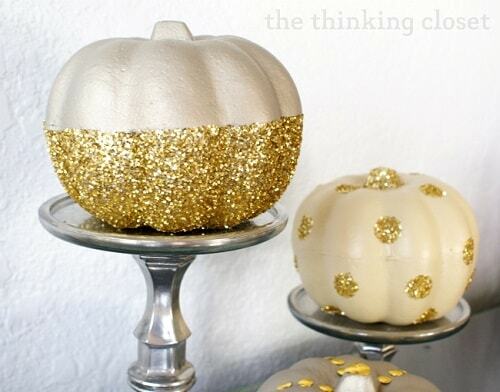 The white pumpkins are only decorated with the gold glitter in various styles as you desired. 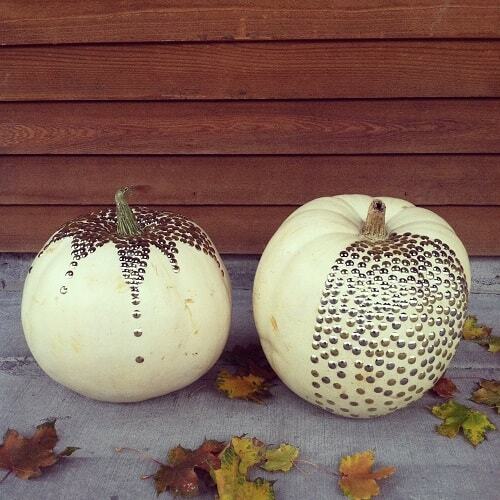 Again, lace is used to enhance the look of a white pumpkin to look way more beautiful. 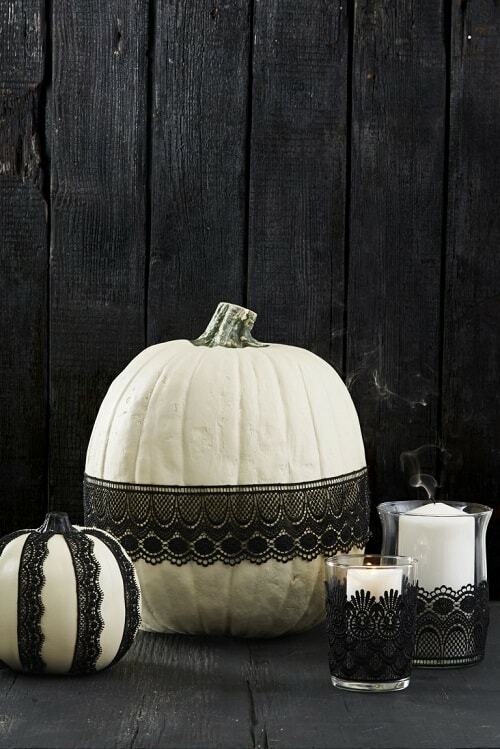 In this idea, the black lace is cut then use to create a stripe accent on the white pumpkin. 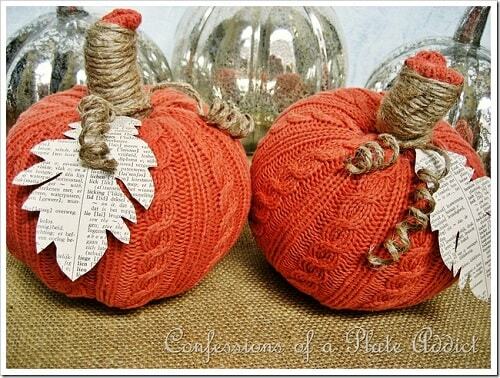 It is, again, very easy to make and you can go with your imagination to lace out the pumpkin! Instead of doing some carving steps, you can choose this more practical idea to create a unique, spooky, and weird Jack O’ Lantern figure. 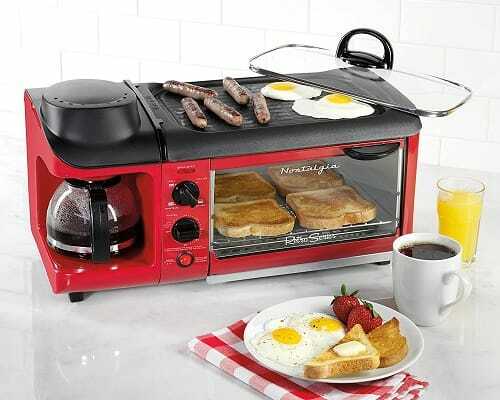 Here, you will need some creativity of repurposing some used things which are available around you. 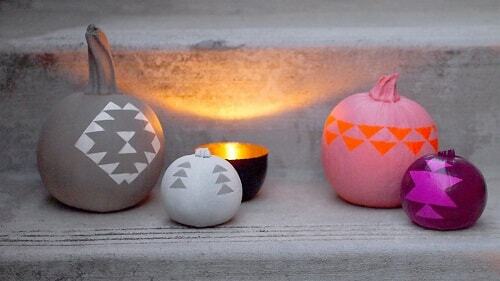 Wonder how to create these adorable pumpkins? It’s so easy! Go grab some balloons, cut the balloon’s stem and stuff it with the small white pumpkin. You can finish this idea in just one minute and would be a nice decor to place side by side with the ghost candle holder and spell books! 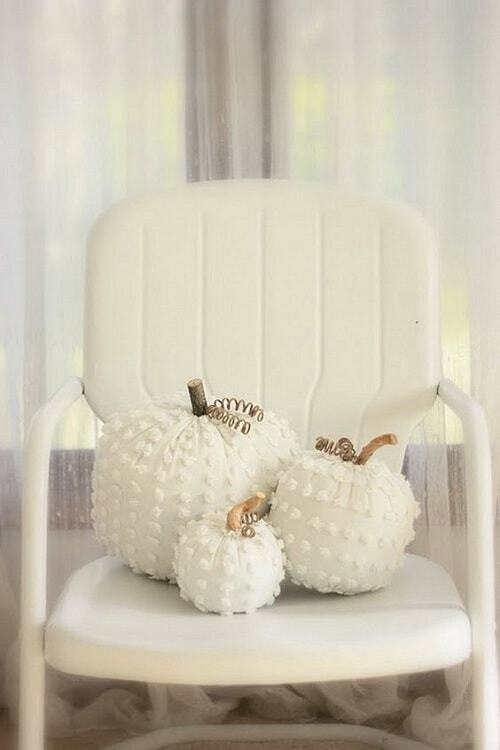 The chic idea of a no carving pumpkin ideas that look so warm and cozy. Go find a used sweater, cut it to make it fit a plastic pumpkin, then secure it by using the twine. That leave which is made of an old dictionary is surely a smart addition to the pumpkin too. It is definitely a worth to try project for this fall! A creative idea which is definitely a great choice for you who are looking for a cute no carving pumpkin ideas. You’ll need to buy some white pumpkins and acrylic paints in lots of colors. 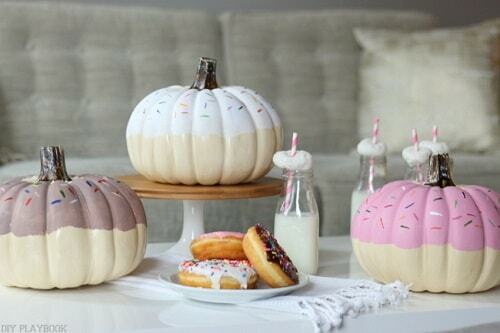 Pain a half of the pumpkin as you wish to create a cute doughnut look! 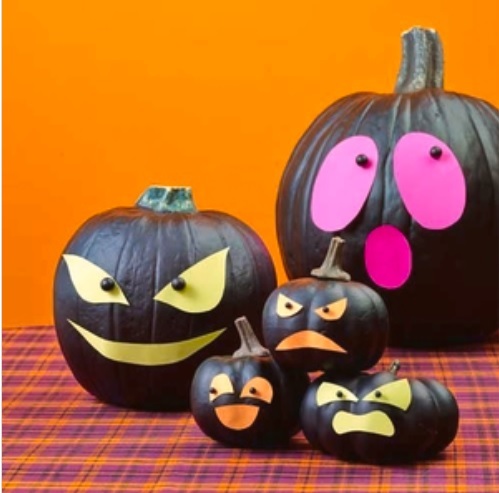 These scary yet cute no carving pumpkin ideas are so adorable! Made of the construction papers in various colors which are cut to create some spooky faces, this decor is surely simple to try. Don’t waste away your Boho taste for your Halloween decor! This beautiful no carving pumpkin ideas in Bohemian style will be one of the best choices to cope with your taste. The steps involve coating the pumpkin in some various colors as you wish then cut the colorful papers in some geometric steps and you can design your own Boho pumpkin based on your imagination! 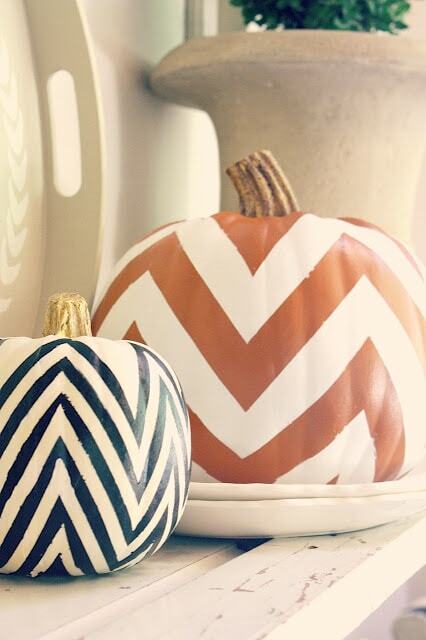 Chevron is still the most favorite pattern until today and you can adopt the trend to one of the noA�carving pumpkin ideas this fall. 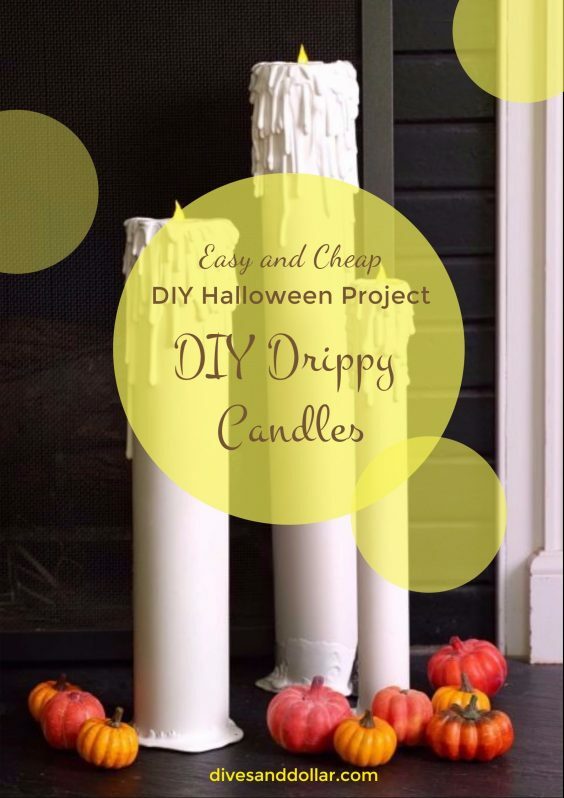 Use the white tape to line the pumpkin and coat it with the latex paint with your desired colors. 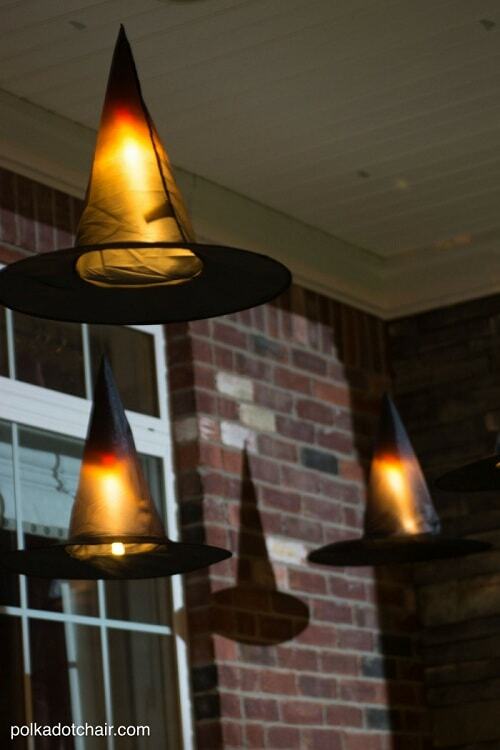 This idea will surely make your Halloween decor look more fashionable! This pumpkin looks kinda creepy and with its queeny look, and will surely enhance the horror atmosphere of your Halloween decor. The eyes and lips are taken from the magazine’s photograph and you can decorate the mask as attractive as possible. This is definitely one of the simplest and cheapest no carving pumpkin ideas to decorate your dining room this fall. 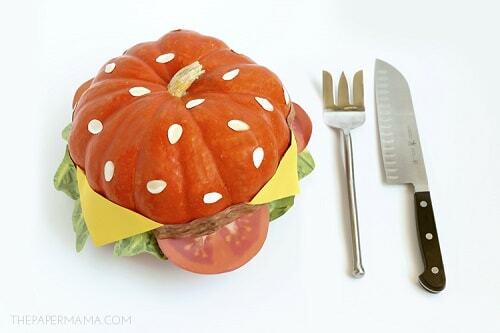 Things that you have to prepare is a flat pumpkin and some printed templates for the cheeseburger accent. 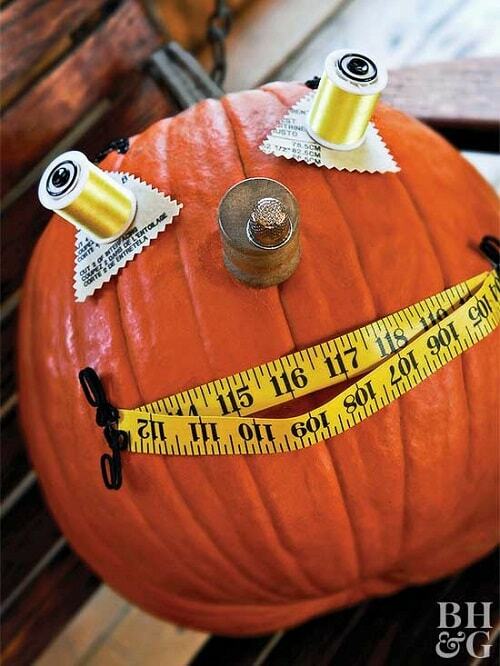 You just need to stick the papers on one side of the pumpkin easily! 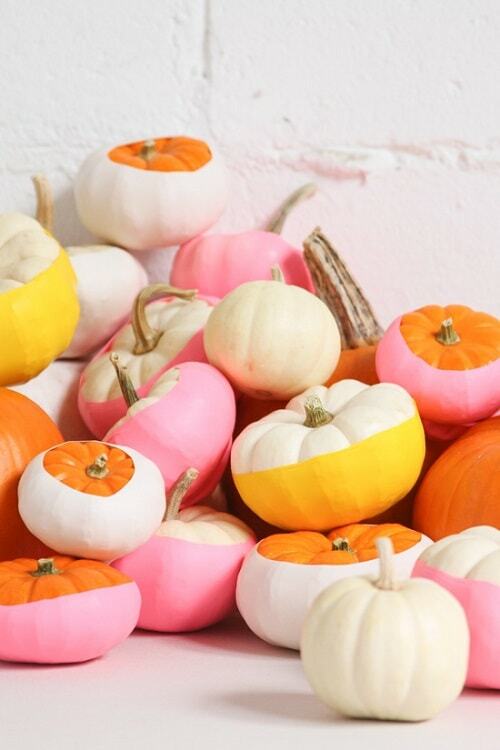 The super cute no carving pumpkin ideas that look definitely adorable. Things that you will need is some felts in some various colors and a plastic pumpkin. Here, the owl seems like wearing a mask which is created by the layers of the felt. This one is a beautiful inspiration of no carving pumpkin ideas that you can place on your dining table. 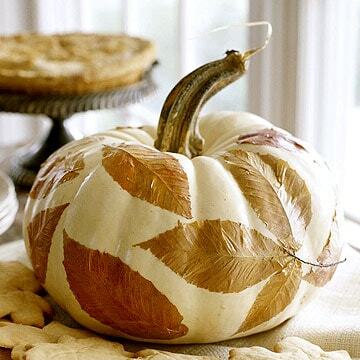 You’ll need a basic skill of decoupage art which is about sticking the leaves properly on the pumpkin. 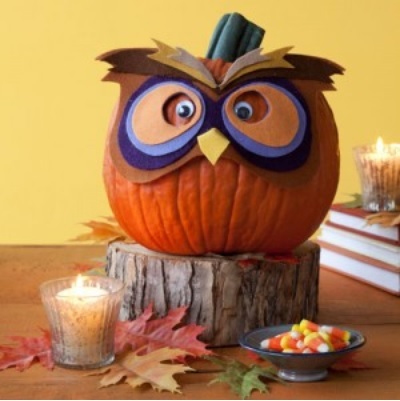 It’s surely fit the atmosphere of fall and will enhance your Halloween decor mesmerizingly. 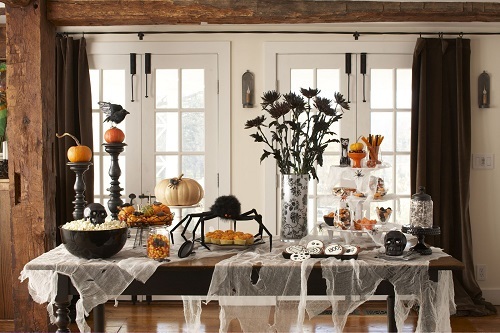 This simple yet gorgeous no carving ideas will give a very chic touch to your Halloween decor. 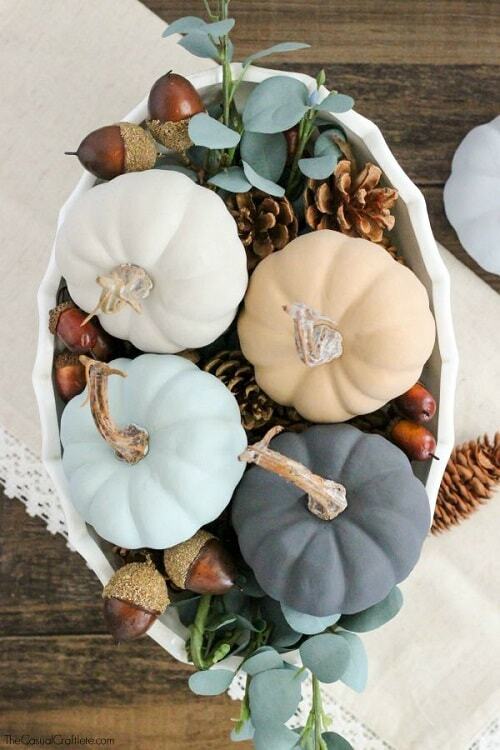 By only coating those small pumpkins with the chalk paint in some pastel colors, you can have them set on your dining or side table. Put it on the bowl full of dried plants, and they look way more catchy. You can also give a golden accent for the pumpkin stem. Superbly cute and spooky! 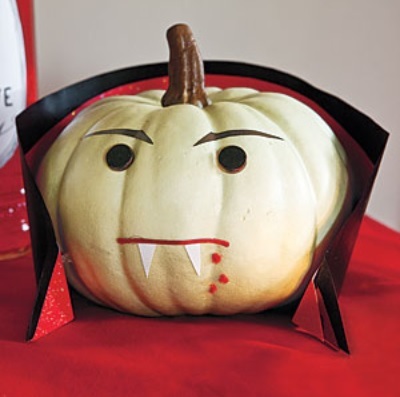 Those are the words that can describe this creative vampire pumpkin. 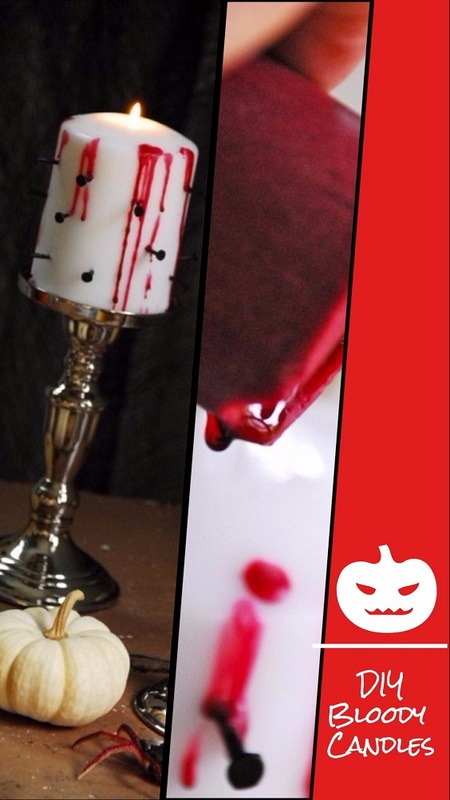 What you have to prepare to create this idea at home are a white faux pumpkin, black bards, construction paper for the vampire’s custom, and red yarn. 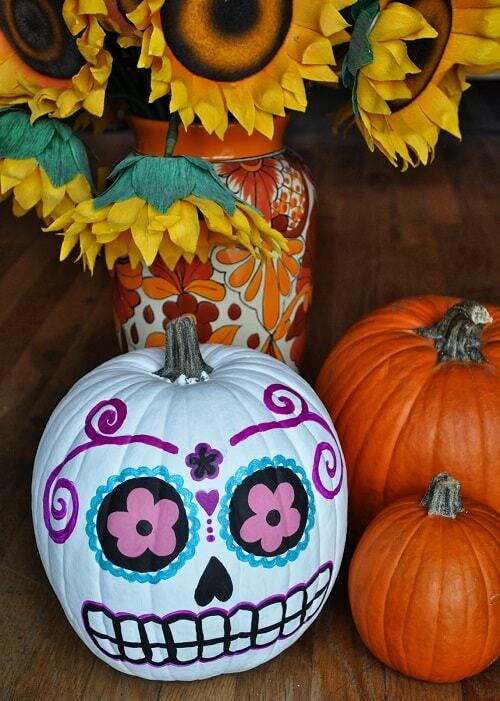 The steps are very easy to follow, and you can have such a unique no carving pumpkin ideas to decorate your table. Here is the wonderful no carving pumpkin ideas for you who want something dazzlingly and vibrantly colorful for your Halloween decor. 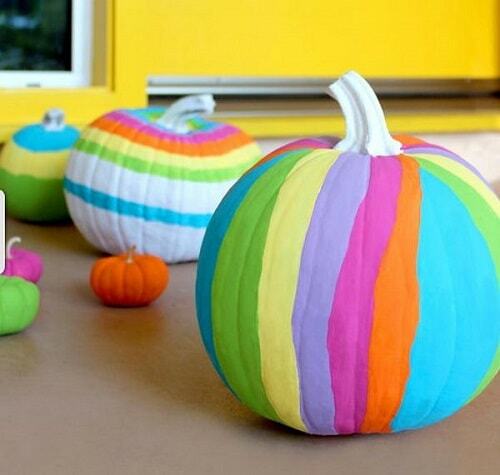 The rainbow pumpkin which is so easy to create at home by only using some acrylic paints in various sweet colors. 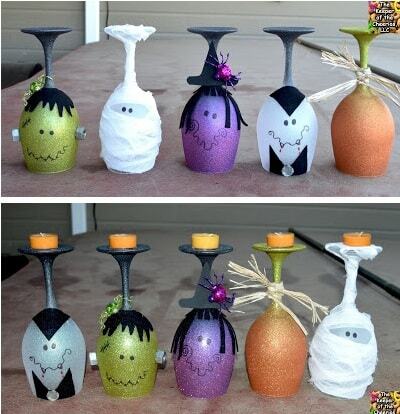 This decor will be a nice compliment when it’s set together with these colorful ghost candle holder! The perfect no carving pumpkin ideas to add a spooky girlish touch to your Halloween decor this fall. Yes, you may need a good painting skill here, but the result is surprisingly admirable! So those are some inspiring no carving pumpkin ideas that you have to try to beautify your Halloween decor. Choose the one that matches your decor style!